According to an article in Nailpro Magazine, the desire to have long beautiful nails first began during China’s Ming dynasty (1368-1644), when aristocratic women grew their nails up to 10 inches long as a sign that they performed no manual labor. To protect their nails, they often sheathed them in gold or silver. Chinese men also grew long nails as a sign of their masculinity and to protect themselves from evil. Our fascination with long nails continues to grow, and has established nails as a multi-billion dollar industry. Ask someone to show you their fingernails, and they will usually point to the nail plate; however, the plate is only one of the many parts that comprise the complete nail unit. Proximal nail fold: means ‘nearest attached end’ and is the soft tissue that protects the emerging nail plate. Lateral nail fold: Is an extension of the proximal nail fold and protects each side of the nail plate. Eponychium is the visible part of the proximal nail fold that appears to end at the base of the nail. 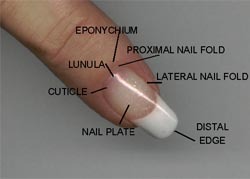 Cuticle: The eponychium will shed a thin, colorless layer of skin that rides on the nail plate and appears to grow from under the proximal nail fold. It is this transparent skin, which is called the ‘true cuticle’, that is removed during the manicuring process. Lunula: The opaque pale white ‘half moon’ at the base of the nail, and forms the emerging immature, plump nail plate cells. As these cells grow forward, they lose their inner material and become flat, hard and transparent. Distal Edge: The distal edge is commonly referred to as the ‘free edge’. Nail Plate: The nail plate is made of keratin protein formed by amino acids. These proteins are a strong, flexible material made from many layers of dead, flattened cells. Hair and skin are also keratin protein; however, they are much softer and more flexible. Matrix: The matrix produces the cells that become the nail plate. The size, length and shape of the matrix determine width and thickness of the nail plate. It is the shape of the fingertip bone that determines if the nail plate is flat, ski-jump, arched or hooked. Nail Bed: The nail bed is made of two types of tissue: dermis and epidermis. The dermis is the lower portion which is attached to the bone, while the epidermis lies just underneath the nail plate. The epidermis moves forward with the nail plate and is attached to the dermis by tiny ‘rails and grooves’ that allow the nail plate to move — much like a train rides on its tracks. As we age, the nail plate becomes thinner and we see evidence of the ‘rail and groove’ as vertical ridges in the nail plate. Solehorn: This type of cuticle is a layer of translucent, dead tissue that is shed from the seal between the nail plate and the hyponychium. It either sloughs off on its own, or is removed during the manicure process. This skin, if not properly removed, can become stained with nicotine and/or other chemicals and will give the appearance that the distal edge of the nail plate is discolored. Hyponychium: Refers to the soft skin that is the distal end of the nail unit and the nail bed. It lies directly under the ‘free edge’. Onychodermal Band: This is the seal between the nail plate and the hyponychium. It is found just under the free edge and can be recognized by its glassy, grayish color. The Onychodermal Band is found in that portion of the nail where the nail bed ends. It cannot be seen on some individuals while it is highly prominent on others. The shape of the nail plate is determined by the shape of the finger bone. In this figure, one can see that the nail plate follows the shape of the finger bone and the plate is fairly flat. The matrix, the Mother of the Nail, is the part of the nail unit that lies underneath the proximal nail fold just in front of the nail root. The leading edge of the matrix is seen as the lunula. The matrix cannot be seen on all nails, but is generally seen on the thumbs, index and middle fingers. The soft, plump cells that comprise the nail plate are developed in the matrix. As they grow out, they loose their inner material and become flat, hard and translucent. The oldest cells are the most compact, making the nail plate harder and more dense closest to the free edge. The longer the matrix, the more cells it can produce, resulting in a thicker nail plate. Any damage to the matrix can be seen on the emerging nail plate. The nail plate is held together by strong, interconnecting bands of protein fibers, and is kept flexible by a sticky residue of oils and moisture that constantly flow upward from the nail bed. When this residue transmits through the plate, it creates a matte shine on the surface of the plate. It is also the substance that allows the nail plate to bend and flex under pressure. The plate rides forward on the nail bed in a ‘rail and groove” effect – much like a train riding on its tracks. As we mature, the nail bed produces less oil and moisture, and this rail and groove effect becomes evident as vertical ridges in the plate. Many factors determine nail growth, and each fingernail will grow at different rates. Heredity and health determine how fast the nail plate will grow, although the growth slows as we age. People who use their hands a lot usually experience a faster growth rate. The thumbnail will grow about 1 1/2 inches per year, and the left thumb will usually grow faster than the right. The index fingernail will grow the fastest, followed by the pointer and ring finger, which grow at almost the same rate. As a rule, the longer the finger, the faster the plate will grow. Nails also grow faster in summer than in winter, and faster during pregnancy. After pregnancy, the rate drops back to normal. Age also effects the growth rate with nail growth peaking between 10 and 14 years and slowly declining after age 20. Factors that slow nail growth include being immobilized or paralyzed, poor circulation, malnutrition, lactation, serious infections, psoriasis and certain medications. Some people erroneously believe that eating certain foods or using special creams, oils or lotions will increase the growth rate. Although the nail plate requires certain nutrients for proper growth, there is very little evidence that eating any particular food will cause them to grow faster. Creams, oils and lotions are sometimes sold as ‘growth accelerators’, although these claims are false, misleading and illegal. No cosmetic product may claim that it can alter or change any body function. These products and others are only for beautifying the nail plate, and only medical drugs can make such claims. The nail plate cells are made of keratin which is a type of protein composed of amino acids. A protein can be thought of as a long chain that can be tied together like the rungs on a ladder to form a ‘cross-link’. This cross linkage gives the nail plate strength, while the oils and moisture form the ‘cement’ that hold the nail plate cells together and keep them well lubricated, resulting in a strong, flexible nail. We equate nail strength with hardness, though in actuality, nails are only strong if they have a combination of strength, hardness and flexibility. If something is strong, it simply means that it can withstand the forces meant to break it. A glass rod is strong, but can be easily broken. Hardness measures how easily the plate is dented or scratched. Flexibility determines how much the plate will bend. Strength shows how likely the plate is to break under force, and Toughness is a combination of these properties. The combination of strength and flexibility create the ideal nail plate. Many factors can cause changes in the nail plate, resulting in lowered levels of strength and flexibility. For instance, water will absorb into the nail plate causing the cells to shift and change shape. Repeated or prolonged exposure to water can resulting in dry, split, brittle, or peeling nails. Solvents will also have a drying effect, although the effects are only temporary. Repeated and prolonged contact with water (the universal solvent) or other household solvents can have a lasting effect on the nail plate, or result in irritant or allergic contact dermatitis from overexposure. The symptoms of these two types of dermatitis will generally manifest itself as red, swollen, irritated or itchy skin. Remove the ‘allergen/irritant’, and the symptoms will disappear. This is why nail technicians across the country recommend their clients wear protective gloves when exposing themselves to excess amounts of water or household chemical solvents (cleaners). Remember, everything we see and touch is a chemical except for light and electricity. Some chemicals are more hazardous than others, which is why reading the warning labels on the products we use and following the manufacturers instructions for safe use are imperative. Allergic contact dermatitis from overexposure to any potentially hazardous chemical will remain with us for life. Every time we expose ourselves to the ‘allergen’, an outbreak will occur.